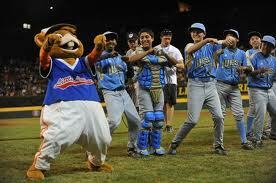 I am looking forward to watching the Little League World Series with my son, Lefty. I think he is getting to the age where he can relate more to the players. In the past, they may have appeared to be “big kids” to him. But now, they are just a few years older than he. Although, the size of some of these 12 year-olds may still make him think these are adults. The United States teams have won the most championships. Taiwan is next. California leads all U.S. entries with five world championships. The eight divisions that compete in the International Bracket are Canada, Mexico, Caribbean, Latin America, Japan, Asia-Pacific, Europe-Middle East-Africa and Trans-Atlantic.